Three-quarters of black Protestants say Trump’s behavior and decisions are emboldening white supremacists while slightly more than a quarter of white evangelicals agree with that view. Overall, more than half of Americans — 54 percent — say this is the case. 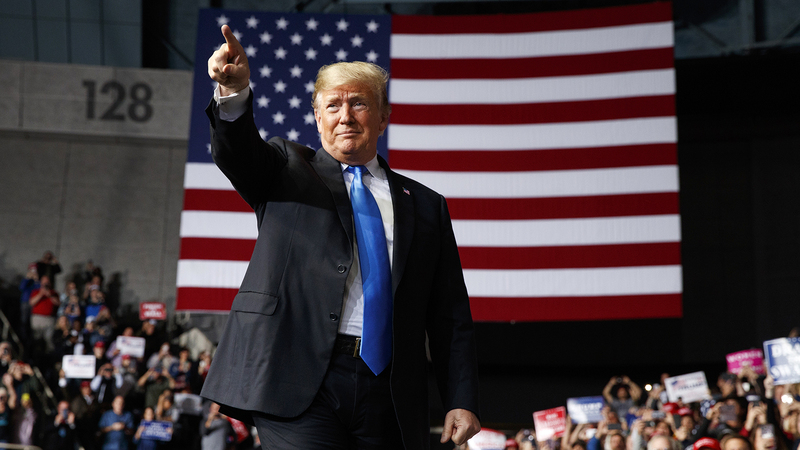 President Trump arrives to speak at a campaign rally at Bojangles’ Coliseum on Oct. 26, 2018, in Charlotte, N.C. (AP Photo/Evan Vucci)The findings, released Monday (Oct. 29), are part of Public Religion Research Institute’s 2018 American Values Survey, which addressed U.S. views on issues such as the presidency, the #MeToo movement, immigration and police brutality. The survey comes days after a massacre at a Pittsburgh synagogue by a gunman with apparent anti-immigrant animus and a racially motivated shooting in which a white gunman killed two black people at a Kroger supermarket in Jeffersontown, Ky., after trying unsuccessfully to enter a predominantly black church. PRRI found that majorities of the religiously unaffiliated (69 percent), Hispanic Catholics (68 percent), non-Christians (64 percent) and Hispanic Protestants (63 percent) say the president is encouraging white supremacists, compared with fewer than half of white mainline Protestants and white Catholics (43 percent each). Evangelicals — and, to a lesser degree, white Catholics — also voted for Trump by wide margins in 2016 and many continue to support him. Percent who agree that President Trump’s decisions and behavior as president have encouraged white supremacist groups. 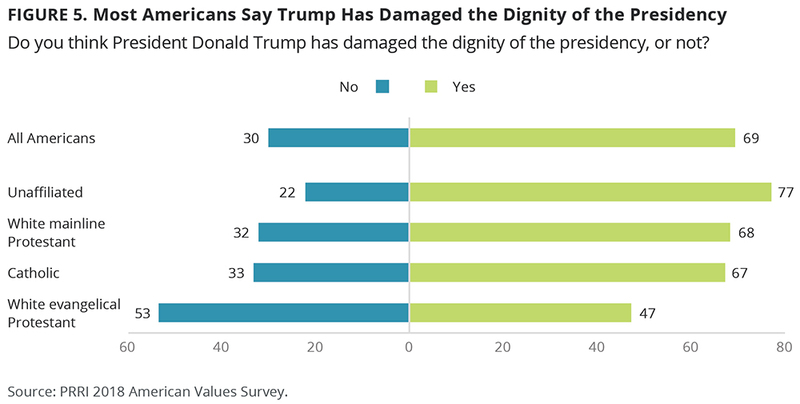 Graphic courtesy of PRRIPRRI CEO Robert P. Jones said white evangelicals also are outliers in their views about whether Trump has damaged the dignity of the presidency with his speech and behavior, with two-thirds or more of every other major religious group in the country saying he has. 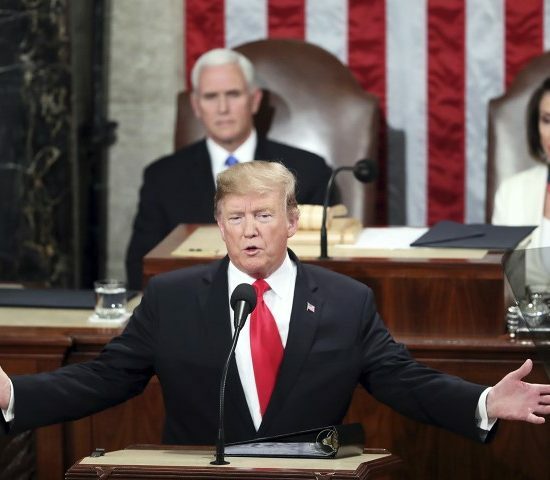 “White evangelicals stand alone: They’re a little bit divided but most of them say, no, he has not damaged the dignity of the presidency,” Jones said at a Brookings Institution event at which he discussed the survey’s results. Majorities of religious groups — with the exception of white evangelical Protestants — also reported having unfavorable views of the president. In contrast, slightly more than two-thirds of white evangelicals (68 percent) said they have a favorable view of the president. University of Pennsylvania political scientist Michele Margolis said the findings reflect the political persuasion of the respondents and the way race and politics are so often linked. “When you say black Protestant and white evangelical you’re also saying overwhelming Democrat, overwhelmingly Republican, and therefore it’s not surprising that those are the results you see,” said Margolis, author of From Politics to the Pews: How Partisanship and the Political Environment Shape Religious Identity. “Most Americans Say Trump Has Damaged the Dignity of the Presidency.” Graphic courtesy of PRRIPRRI researchers found gaps in opinion about whether recent killings of African-American men by police are part of a broader pattern of police treatment of blacks or isolated incidents. Fifty-three percent of Americans said they fit a broad pattern while 45 percent said they were isolated. But 71 percent of white evangelicals said such killings were isolated matters, compared with 15 percent of black Protestants. Catholics and white mainline Protestants fell somewhere in between: 63 percent of white Catholics, 59 percent of white mainline Protestants and 43 percent of Hispanic Catholics called such incidents isolated. Jones, author of The End of White Christian America, said he is often surprised by the way white evangelicals and African-American Protestants end up at polar opposites on surveys. “These two groups actually share a lot in terms of their theological beliefs, their beliefs in the Bible, and it really is the lens of race that kind of refracts those theological commitments and behaviors into really near-opposite directions on questions around race,” he said. Asked if immigrants threaten or strengthen American society, 60 percent of respondents overall said, in general, newcomers strengthen the U.S., while 37 percent said they threaten American values and customs. White evangelicals were the only major religious group in which a majority (57 percent) said immigrants pose a threat. The survey also touched on views of those within and outside religious communities about the #MeToo movement. Overall, 62 percent of Americans said congregations are not successfully responding to the issue of sexual assault and harassment. White evangelicals were again the outlier among religion-related groups in the survey. Sixty percent said congregations are handling the issue “somewhat or very well.” Majorities of others — from 82 percent of religiously unaffiliated Americans to 55 percent of white Catholics — said churches and religious organizations are doing a poor job on those matters. 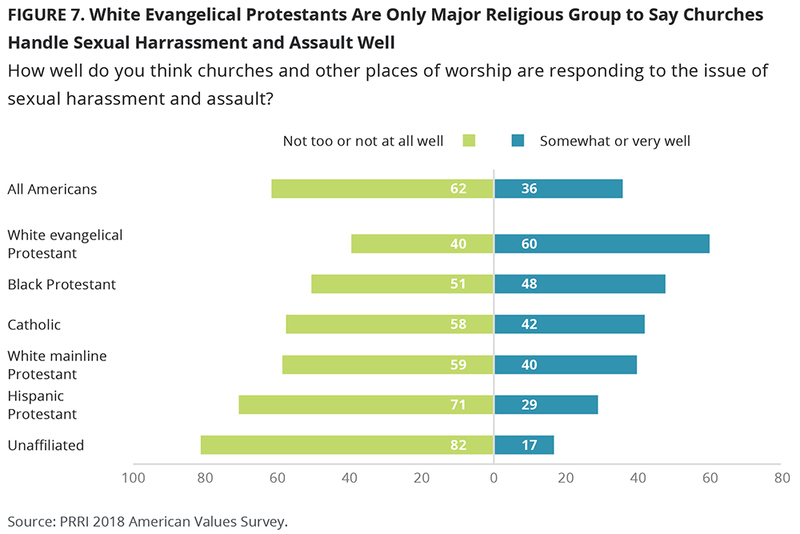 “White Evangelical Protestants Are Only Major Religous Group to Say Churches Handle Sexual Harrassment and Assault Well.” Graphic courtesy of PRRIWhile men and women in the same religious tradition often had similar views on #MeToo-related subjects, Catholic women were much more likely than Catholic men (66 percent versus 48 percent) to give houses of worship a poor score. In assessing the #MeToo movement, 48 percent of white mainline Protestants, white Catholics and Americans overall said it had helped address sexual assault and harassment in the workplace. 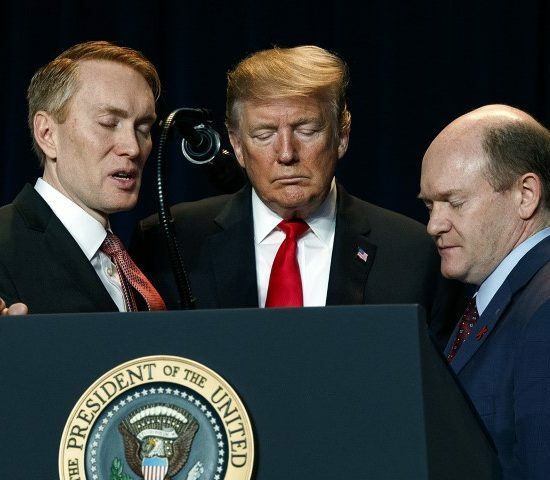 Less than a third (29 percent) of white evangelicals said the movement had helped with those issues and 31 percent said it had led to unfair treatment of men. More than half (52 percent) of black Protestants said the movement had been helpful and 10 percent said it led to unfair treatment of men. The overall survey of a random sample of 2,509 adults had a margin of error of plus or minus 2.8 percentage points. The margin of error for religious groups surveyed ranged from plus or minus 5.9 percentage points for the unaffiliated to 13.2 percentage points for Hispanic Protestants.